AKA William Frank Buckley, Jr.
William F. Buckley Jr. was a prominent conservative American political commentator. His grandfather made millions in the oil business, and his father made many millions more with ownership of the Catawba Corporation, using the extended Buckley family's almost-complete control of six giant oil companies to ensure that all six companies relied on Catawba for lucrative geological, geophysical, accounting, and technical services. Like his nine brothers and sisters, Buckley had Latin American nursemaids and French governesses, and he grew up trilingual. As a young boy, on his father's recommendation, Buckley read the works of Albert Jay Nock. He was drafted into the Army in 1944, and upon his discharge in 1946 worked for the Central Intelligence Agency, where three of his siblings have also been employed. Buckley's immediate supervisor at CIA was E. Howard Hunt, who sent him to Mexico City, where he was charged with undermining the Mexican government. At Yale, Buckley was the star of the debating team, and earned his bachelor's degree in 1950. Upon graduation, Buckley promptly wrote God and Man at Yale, a book criticizing his alma mater for straying from its original, Christian mission. He was an editor at The American Mercury for several years, before his aggravation at the liberal policies of the Eisenhower administration led him to start his conservative magazine, National Review. National Review quickly found its audience, making Buckley a political force. It was cited as influential by conservative leaders such as Barry Goldwater and Ronald Reagan. In 1960, Young Americans for Freedom (or YAF, as it was widely known through the 1960s) was founded in a meeting at Buckley's Connecticut estate. During the Watergate scandal, Buckley underwrote his former CIA boss Hunt's legal defense. Buckley's newspaper column, accurately titled "On the Right", was syndicated beginning in 1962, and in 1965 he ran for mayor of New York on the Conservative Party ticket, receiving about 13% of the vote. 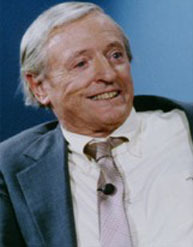 In 1966, Buckley began hosting Firing Line, a political talk show on National Educational Television, the forerunner of PBS. 1,429 weekly episodes were produced over the next 33 years, until Buckley stepped down in 2000. He resigned from management of National Review, but continued writing for the magazine until his death. When Attorney General Robert F. Kennedy rejected repeated invitations to appear on Firing Line, Buckley quipped: "Why does baloney reject the grinder?" He also once threatened to punch Gore Vidal in the face, after an exchange of insults. As AIDS became a topic of conversation in the 1980s, Buckley suggested that those diagnosed with the disease should be tattooed on their backsides, presumably to protect uninfected Americans. Buckley was fined twice by the Securities and Exchange Commission, $1.4M for violations related to National Review stock, and $800K for trade violations involving the family's fortune. Buckley also found time to write a series of novels about fictional CIA spy Blackford Oakes. Oakes manifested Buckley's foreign policy against Cuba in See You Later, Alligator, against East Germany in Marco Polo, If You Can, and against the Soviets in High Jinx, among several other titles. In his last Oakes opus, 1995's A Very Private Plot, the spy was called to testify about secret operations conducted in the 1980s.